Some of the SECHS VOLT crew has been cought several times playing with high voltage lately. Only a few days ago, during a cruising in the outskirts of Oslo, this incident was caught on film. Jon Roar Uhlstad in Sandefjord, Norway made this nice stickers for us. Since I was driving a "DANGER! High voltage-car" to Mantorp I have this sticker in the BIG window. Look closely and you will spot both Fürsten and the shelf of early fifthies parts (in the same picture!!!) Big thanks to Hot Shop and OVWC for a great evening. My split is not perfectly restored or original, but its a nice driver, and not rusty. Today I drove it to work with a big smile on my face :-). Btw: My girlfriend named her Olga.. She's a 57 year old lady that'll nead alot of attention and care too stay in the good mood. She actually was a little grumpy in the beginning, but now I am starting to know her needs. She's also started trusting me. But her mood all depends on if she's getting her weekly care of "pedicure", "manicure" and "lotions". Even if she wants it - there'll be no extreme makover yet. 9.000 hits gives you a Sechs volt babe! 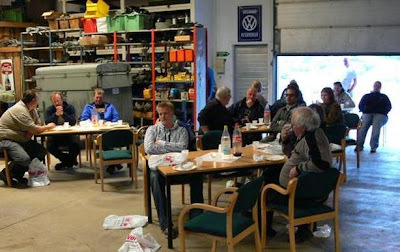 Last night Oval57 attended one of the annual meetings organized by the norwegian vintage VW-club. And what did he discover? 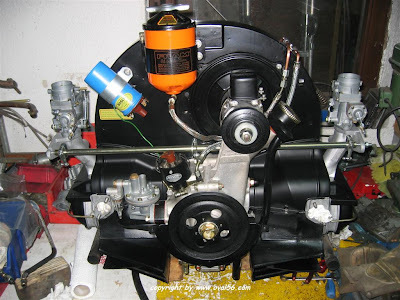 A beautiful 52 split loaded with options. 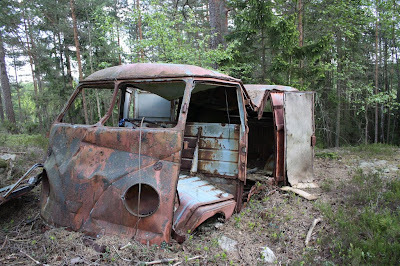 Most of the options was mounted original in Norway by a norwegian dealer. Cold beer and soft drinks all weekend! I have this excellent Coca-Cola-cooler. Every year I fill it up with 8 deepfroozen-elements and with cold beers for all clubmembers. I did fill it up at 8.30 friday morning, and the beer was still cold saturday nigt. Even the sparkling water we bought warm at City Gross Mantorp was still cold at sunday morning! What a hot weekend with cold drinks! For sale? Never ever! 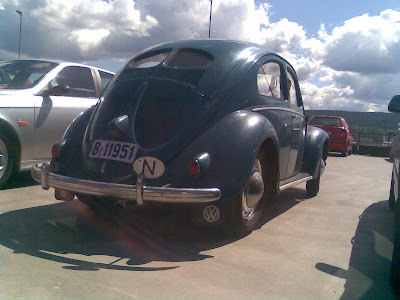 And we think the aircooled community in Scandinavia is a great place to be involved. Thank you to all new and old friends we met during the Bug Run weekend. For us Scandinavians it has become a tradition to all meet in Sweden at the beginning of june each year. Norwegians, swedes, danes, finns and some other europeans make this the meeting of the year. 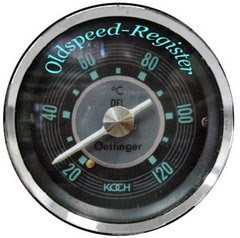 For our garage crew this is the annual higlight, and a milestone for having the cars ready. This year we hoped to go with the azur 51, the green oval 56, the 52 zwitter and the savannah 70. 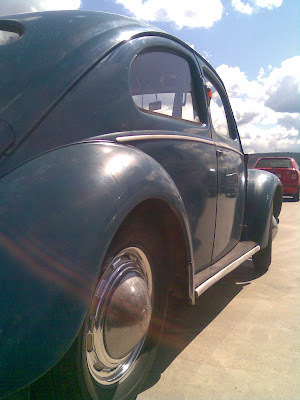 Only the oval 56 had been on the road last year. The others freshly restored after years of storage. The 51 azur was left behind friday morning as we left, after hours of trouble seeking through the night. We left with 3 cars, two six volt and one 12 volt. If it was faith is not known yet, but one car broke down on the way home, and YES, it was the 12 voltage 70 savannah. The zwitter and the oval 56 made it all the way home. Even though it is a high voltage monster of modern technology, we hope to see the car car back on road real soon. It's been on the list of things to do for a long time, but finally we manage to decide a logo for our cars. Not going quite as visible as our fellows in "Screwdrivers", we settled for a rear window sticker. Of course it had to fit both split and oval window. This will probably help to connect our Sechs volt blog to the cars in real life. So when you want to track us down for posting a stupid comment on your ride, we've made the job easier for you =) Thank you JHU for exellent work! Roger is ready for BugRun! What do you think about our new logo? If you have comments about the logo or the blog, please leave a comment. And you; please link us up from your blog or webpage. After work yesterday I spotted a new old-style-shop in the city. 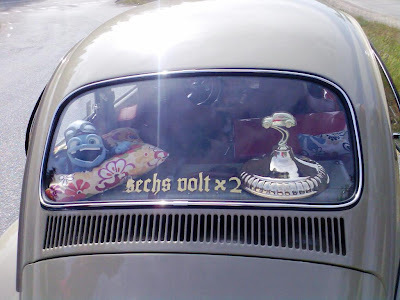 I found these two Chinese VW`s and a Philips bulb-box. Sadly it only contains 12 V, so I crushed them:) 6 Volt forever! This weekend the light blue Zwitter drove the hole way home to the owners house. He is a lucky and happy man these days. 2 years with hard work, and he could finally drive the car home to his family. I have not asked him what his wife did say about the car? Maybe he can blog it? The picture shows some of the cars by the Sechs volt boys.